I have just about finished all my fun antibiotics and have started to feel normal again, after a year or so of struggle. Thank you to everyone who reached out with good wishes. I really appreciated it. 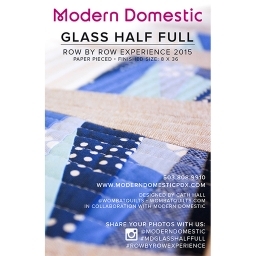 While I have been recuperating I have had a couple of inquiries about when the Row by Row pattern I helped design for Modern Domestic would be available… and today is the day. From November 1st you can purchase the pattern, license plate and even the fat eighth bundle to make the Glass Half Full pattern…. The kit includes the pattern and a fat eighth bundle and all you have to do to win is leave a comment below. I will draw a winner Friday…and of course the competition is open world-wide. I have only recently become aware of a program that is run over summer here in the USA called the Row by Row Experience. From June 21st thru to September 8th over two thousand quilt shops around the USA and Canada give away a free pattern, based on a theme. All you have to do is visit the store to get the pattern. 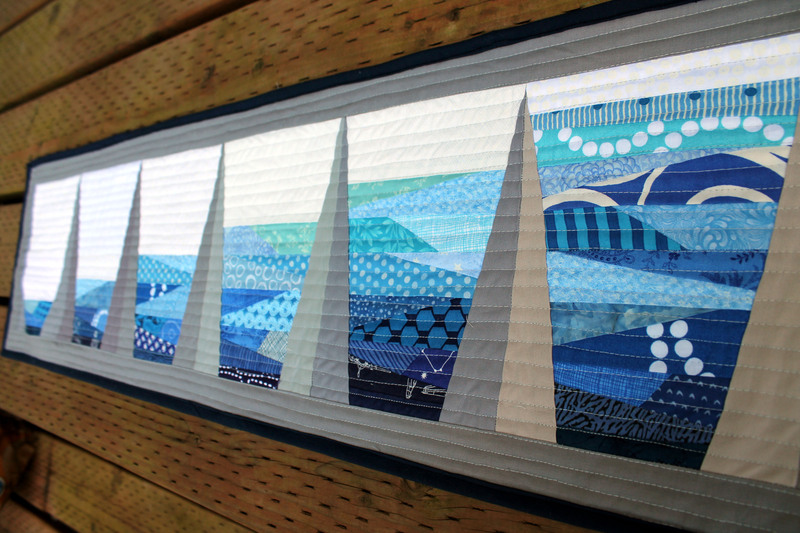 This years theme was H2O (water) and I was excited to work with my local quilt store, Modern Domestic, to design their Row by Row experience….Glass Half Full. The remit was to design a block that was 8 inches high by 36 inches wide. 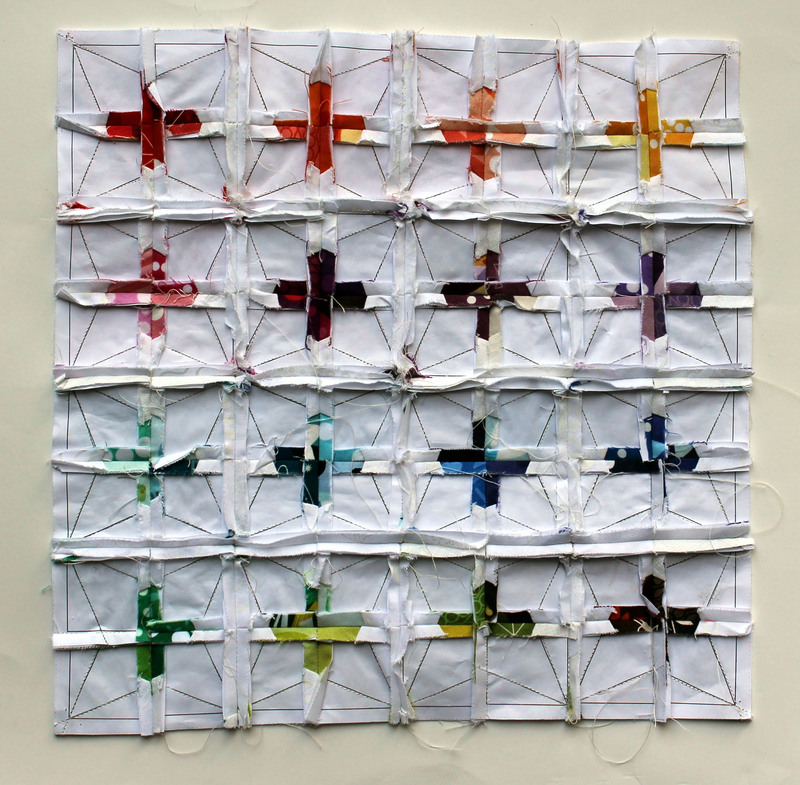 I worked with Michelle Freedman to design a paper piecing block based on the idea of a glass of water. 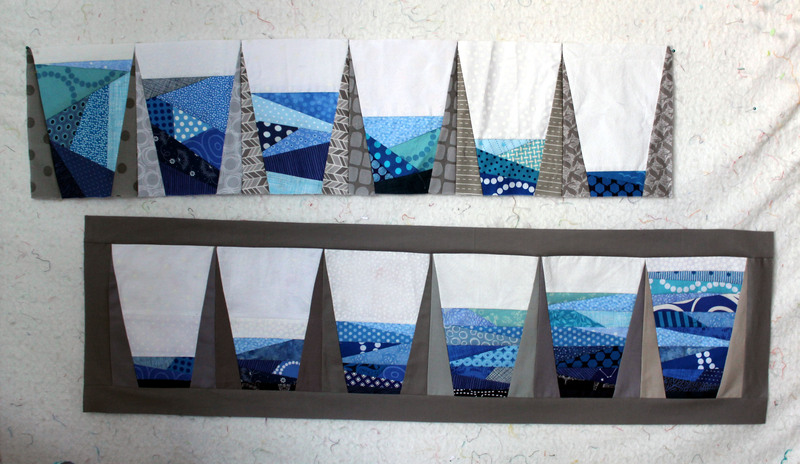 My original block was 6 different paper piecing patterns for the water (you can see the my original test run above). Michelle then streamlined the idea into just one pattern sheet, which still gives you variety in the water but is easier to distribute. 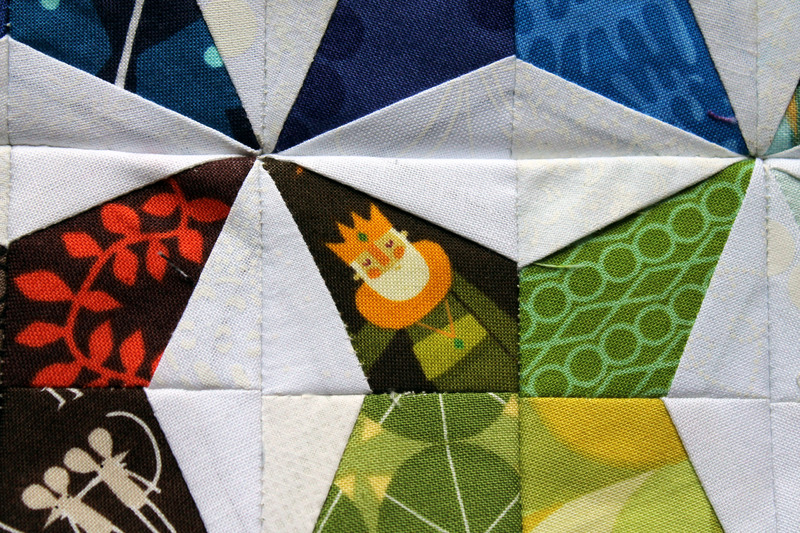 If you are not able to make it to make it to Portland you can check out the Row by Row website to see if your local quilt store is participating… I know there are quite a few stores that have paper pieced their row… including Fabric Depot whose very cool paper pieced block I will definitely be hunting down. And if you are outside the USA, don’t fret, at the end of the September many of the stores will make their patterns available digitally. 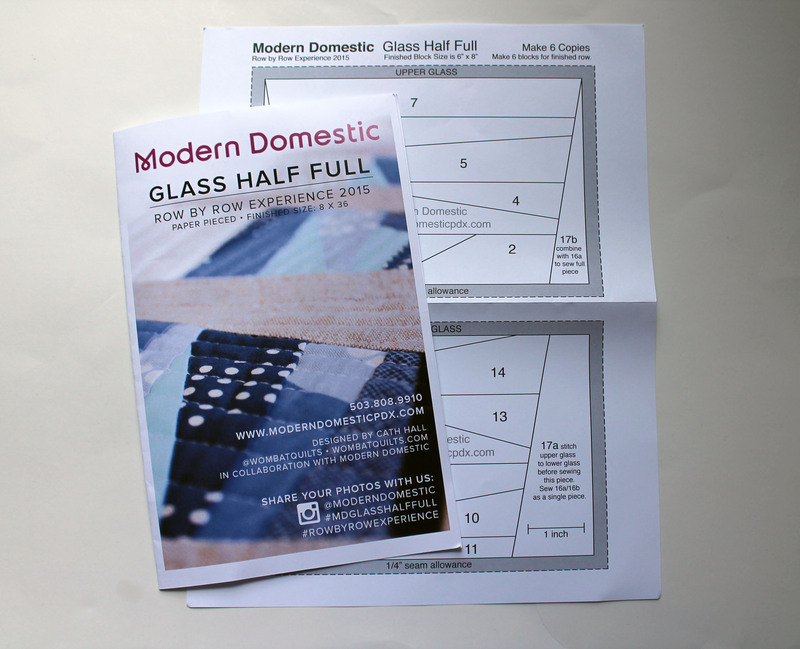 I will let you know when Modern Domestic’s pattern becomes available. 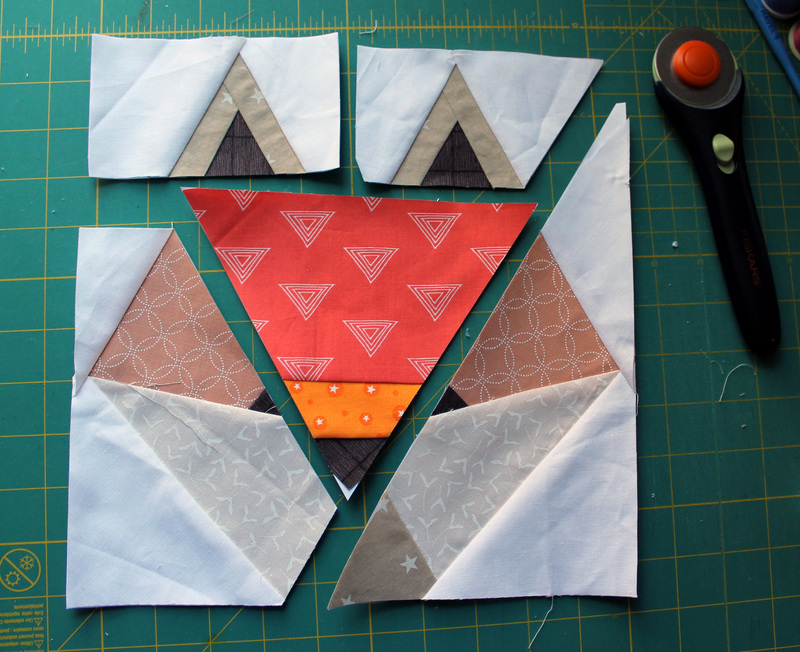 Designing a paper piecing pattern…. 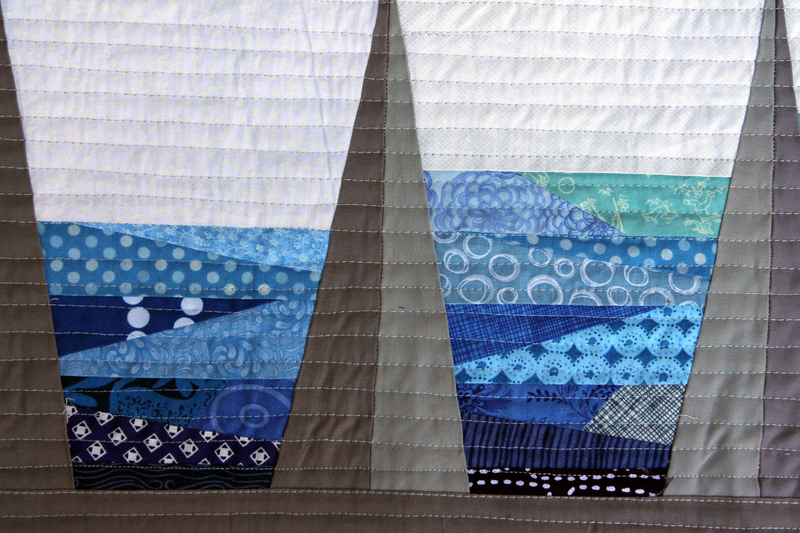 This week I have been playing with a paper piece block that I have designed for a friend’s quilt. She is a big fox fan and seeing she is getting married in August I thought a quilt was in order. 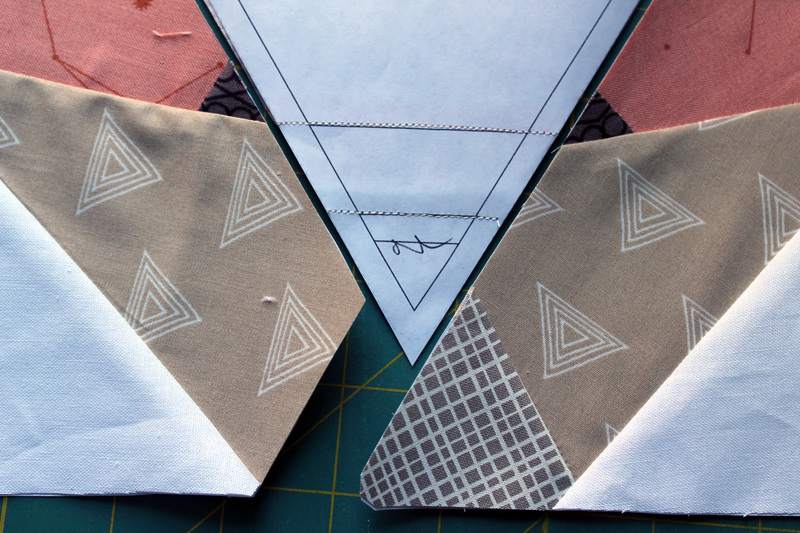 I initially sketched the idea in a my gridded notebook, then transferred the idea into the quilting program EQ. I tweaked a little and then did a test run. I never print out numbers on the blocks in this initial phase, because part of the pattern testing process is to work out which pieces should be numbered in which order. In particular the decision of the first piece glued down is important (I select the most awkward shaped piece to start with if possible). When all the pieces are made I then look at how to make sure that the proportions are right and that all the pieces are okay. With this pattern I went in and tweaked a few bits … I made the nose bigger and got rid of some extra lines that were not needed. I will now go back into EQ and make the changes and finally add the numbers and do another test run. Then when I am happy I will launch into full-blown fox production mode…. 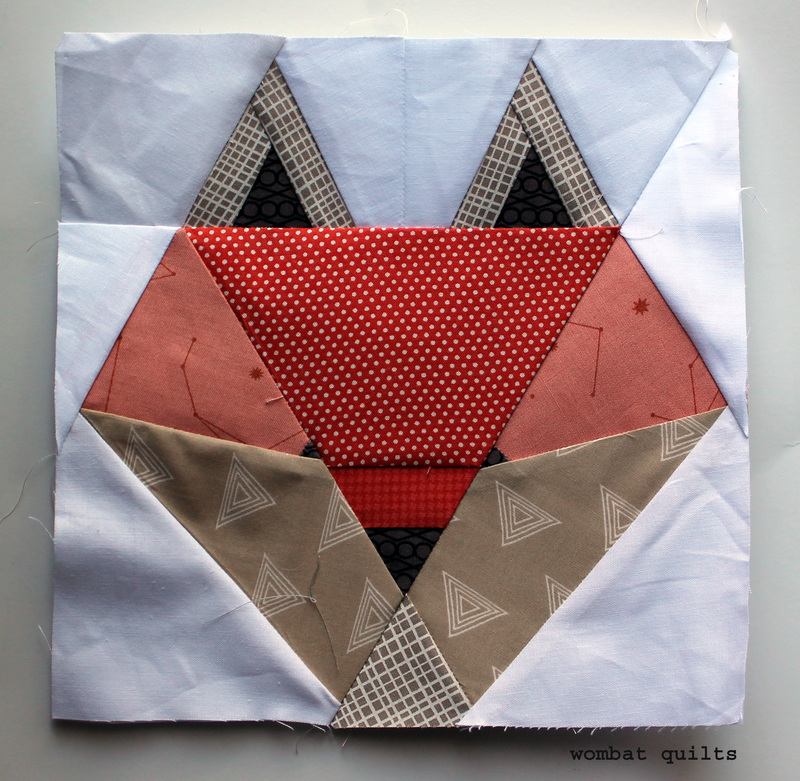 an August deadline is looming and I have a lot of foxes to make! 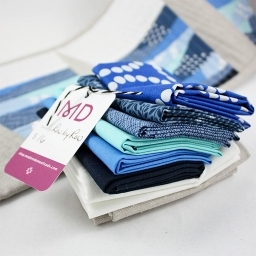 So before I sign off the winner of the fabric bundle is…. 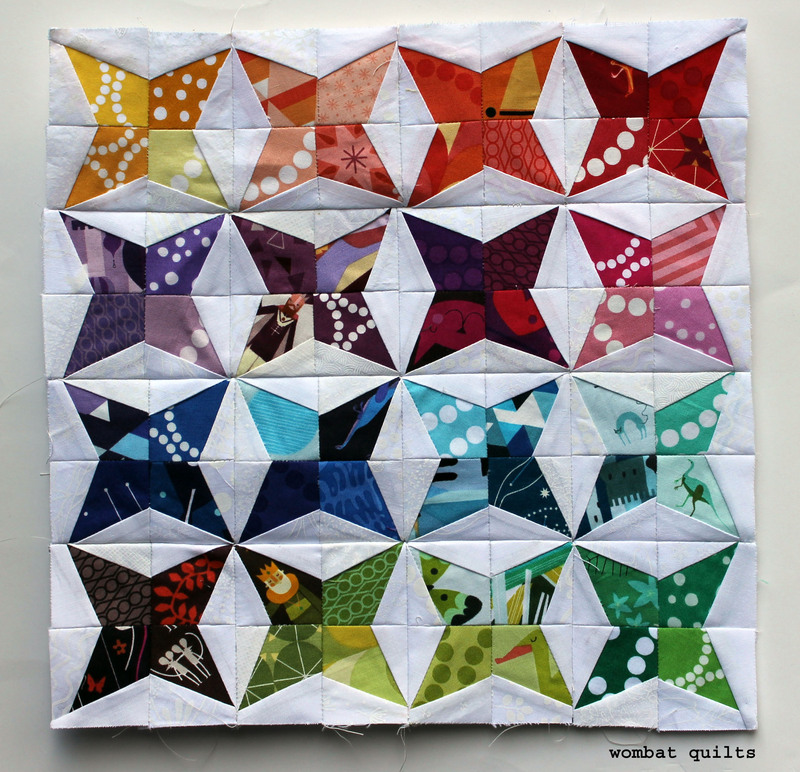 Kirsten who wrote…”I am following along with your progress on this beautiful quilt as green is my favourite colour – all of your stars are just gorgeous and I love the LV backgroundl!”. 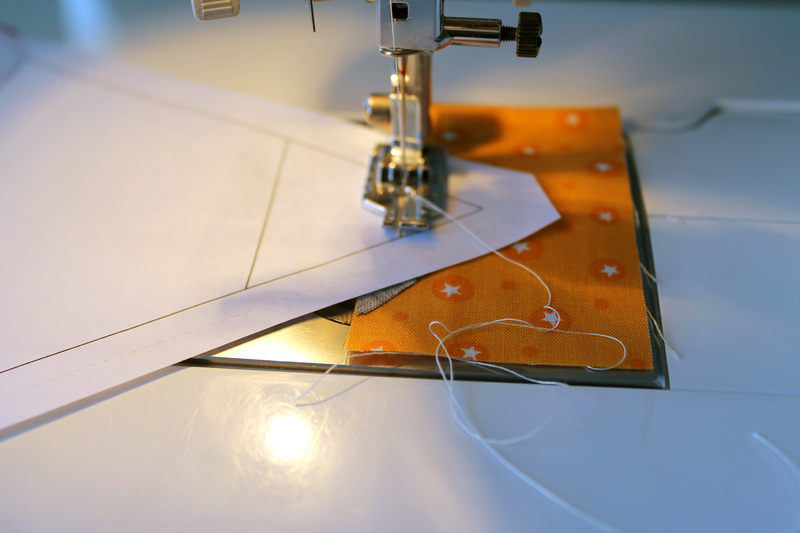 So the fabric will be winging its way to Kirsten. Thanks to everyone who entered. There was such a great response that I will definitely be doing this again…and soon.